The new Gordon B. Hinckley Alumni and Visitors Center will welcome the world to BYU and provide a home away from home for alumni. On one of our first visits to BYU, in the fall of 1999, a young student drove us around in a cart to show us the campus. It was a cold day, snowing lightly as our cart rolled along the sidewalks. Suddenly, classes let out and the doors of the buildings opened, flooding the sidewalks with students. But when our cart came along, it was like the Red Sea parting. The students moved to the side and smiled at us. We were taken aback by these friendly, polite BYU students, and as we have returned again and again, we have met nothing but wonderful students. As you walk across BYU campus, you can feel a difference from other schools. It’s like being on sacred ground. You don’t just see the difference; you feel it. You know that something here is special. You are surrounded by marvelous students and by buildings named for such men as George Albert Smith and Spencer W. Kimball and David O. McKay. Just as President Hinckley has been an extraordinary ambassador for the Church, so this building will represent BYU to the world. For a long time we—and others—have wanted to erect a building here in Gordon B. Hinckley’s name to honor the campus, to honor the alumni, to honor the students. But the time wasn’t right until recently. And now we will break ground for the Gordon B. Hinckley Alumni and Visitors Center on his 96th birthday, June 23, 2006 (see “A Welcoming Campus Home.”). This building will welcome the world to campus and tell the BYU story. It will include exhibits to introduce visitors to the special mission and spirit of Brigham Young University. It will be the gateway to campus for new students, ambassadors, parents, and journalists. The building will also be a home for alumni, a place to sit back, relax, and enjoy family, friends, and activities. It will not just be a place where records are kept; it will be a home away from home for alumni. Finally, this building will be a monument to honor the legacy of our prophet. President Hinckley is a great man. He has the world on his shoulders, yet he has time for the individual. We admire his dedication, his focus, and his tenacity. He has been a member of the BYU Board of Trustees since 1961, making significant contributions to the university over the years (see “My Dear Young Friends”). He has been in the First Presidency since 1981, and he has done so much for the Church—for each of us. This building is a fitting tribute to him. Just as he has been an extraordinary ambassador for the Church, so this building will represent BYU to the world. We are supporting the Gordon B. Hinckley Alumni and Visitors Center because we love President Hinckley and we love BYU, this special place that has been dear to us since our first visit. We invite everyone to join us in supporting this school and this building project. We are matching student donations five-to-one and BYU employee donations one-to-one (for gifts up to $5,000). We have also joined with the rest of the BYU President’s Leadership Council (see “Building BYU”) to offer a one-to-one match for alumni donors. This is a once-in-a-lifetime opportunity—to honor this great man, to help construct a wonderful building, and to have a contribution matched. We will be seeking donors for this building until it is completed, and donors’ names will be included in a time capsule and a commemorative book. We look forward to entering President Hinckley’s office one day to show him the building’s donor book, filled with names of people who participated in his building. We want everyone in the BYU family to give—to enjoy the blessings of giving and to be a part of this building. It doesn’t matter how small of a part it is; it takes a lot of people to build a beautiful edifice to honor our prophet. 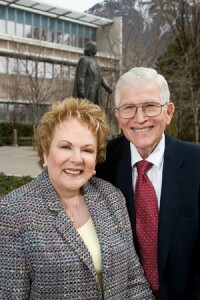 INFO: To donate to the Gordon B. Hinckley Alumni and Visitors Center, call 1-800-525-8074, or visit gbhb.byu.edu.